Hello Readers! It's been ages since I updated my blog, but I'm hoping to start sharing this feature from my Author's Newsletter. My writing schedule and this autumn's author tour schedule has sucked up most of my time, so I have less of that to dedicate to any side projects (including blog posts :P). Living Life Authorly, however, is a project I hope to share every other month through my newsletter, and the following months here on my webpage. With this particular feature, I will attempt to write a reflection that is both informative and inspiring. I hope to discuss my journey as an aspiring author, as well as offer some advice to those just starting out or those thinking of taking on the great and worthy quest of writing their own stories, big or small. Furthermore, I plan to occasionally include some tips and advice with regards to building your brand as an author. Hopefully you'll find some encouragement and inspiration from my words. It Started as an Art Assignment . . . The Legend of Oescienne began in a sketchbook, a simple artist’s sketchbook which ended up more full of character and creature ideas, and even a few lines of text regarding these beings and their world, than the mundane, daily objects and situations I was, as an art student, supposed to be filling the pages with. All the while I was happily doodling away, I was oblivious to the significance of these things until one day the realization hit me like a spark of lightning crackling through my mind (Robyn might be able to relate to this one ;)): I needed to write this story down or no one would ever get a chance to read it. It was in that moment, in the living room of my apartment, that I realized I wanted to be an author. I was twenty-four years old and despite having attended college for the past handful of years, I still didn’t know what I wanted to do with my life. Perhaps it was Fate, then, trying to tell me at that early stage, that patience would be a virtue I should learn to respect and welcome. I moved back home after graduating with a big idea, the determination to meet a challenge I’d never faced before and a strong belief in what I had to say (what my Muse had been stirring up in my mind for goodness knows how long and what I was terrified of beginning) would be worth all the time and effort I knew it would take. The months passed by and the words started to fill up a once blank word document. Back in those early days, I was still thinking in terms of page count and not word count. I kept this endeavor a secret, even from my family. Only after I had completed fifty pages did I work up the gumption to tell them, with my heart in my throat, what I was doing locked away in my room. To me, meeting that fifty page milestone meant I was really going to do this - I was going to write a book. After that fateful day when I made my big reveal, a weight seemed to be lifted. I had admitted I was embarking upon a perilous journey and my family had not disowned me. Now, I could really dig in. I tweaked the plot when it wasn’t working out, I printed out hard copies of the manuscript and attacked it with a red pen. During my lunch breaks at my then current job of working in a pet store, I would pull out a small, beat-up notebook and jot down my ideas. 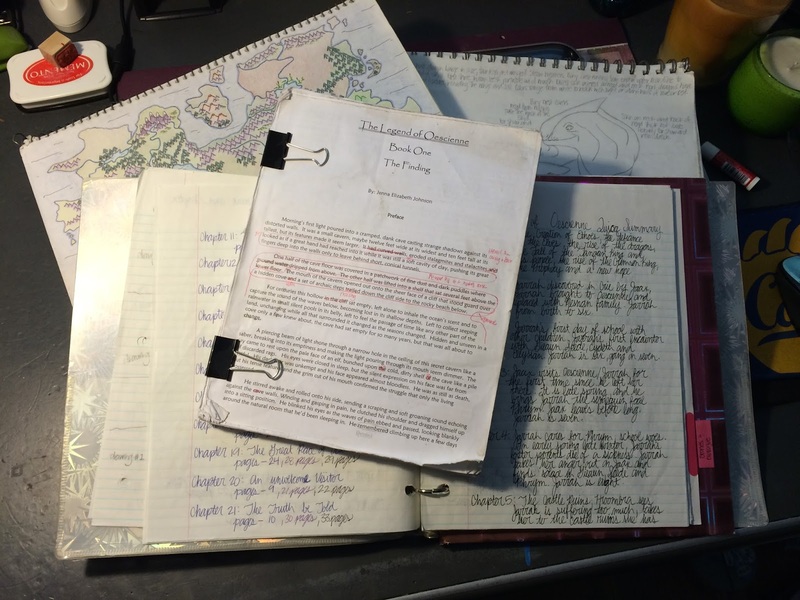 For four years I chipped away at this big idea until a cohesive story began to form. I attended writers’ conferences and took a few creative writing seminars at the local community college. Online I discovered support groups and forums for those of us aspiring authors who were spilling upon the Great Plain of the independent publishing world. I made plenty of mistakes along the way and faced down my daily frustrations, but I persevered. I don’t consider myself a very patient person (I decided to self-publish after just ten rejection letters), but somehow I managed to find some modicum of patience for this. Or perhaps I just didn’t give up on it. I had been raised always to stick out a commitment, but this was something different. Writing was my calling. Finally, I had found my niche in life. Despite the long hours and rejection and negative reviews and scant income, I have stuck with it. I’m in for the long haul because I know, even if the next bright idea isn’t quite hatched yet, I understand it’s just around the corner. Time and time again I have stared at my computer screen, frustrated that the story just isn’t flowing at the speed I’d like it to, only to realize a few days (or weeks or months) later, after just leaving it be, it unfurls before me. Even now, as I'm going through another period of Author's Frustration with Life and the Unknown, I have faith that it will pass and the stories will eventually burst forth. For those of you just starting out - the ones with that spark of an idea that has not yet grown, and for those of you who have been at this game for a while, know that inspiration can come at any moment, and most often does when you least expect it. As much work as it takes to form that spark into something tangible, sometimes it’s waiting for that initial flicker to push itself to the surface that is the hard part. Writing a book can be tedious, time-consuming and frustrating, but it is something we can do if we put ourselves in front of that computer screen and work at it. When you can admit that to yourself and when you can make peace with the fact that not everything will fall into place just as you wish it, you have taken that next step in not just becoming, but being the author you have always wanted to be. Carry on, my fellow scribes, and don’t fret over those moments where you don’t have the answers. It will get better and you will rejoice when everything falls into place. I really enjoy reading your blog, especially such articles as this, but I personally prefer to buy cheap essays online and spend free time relaxing with friends.